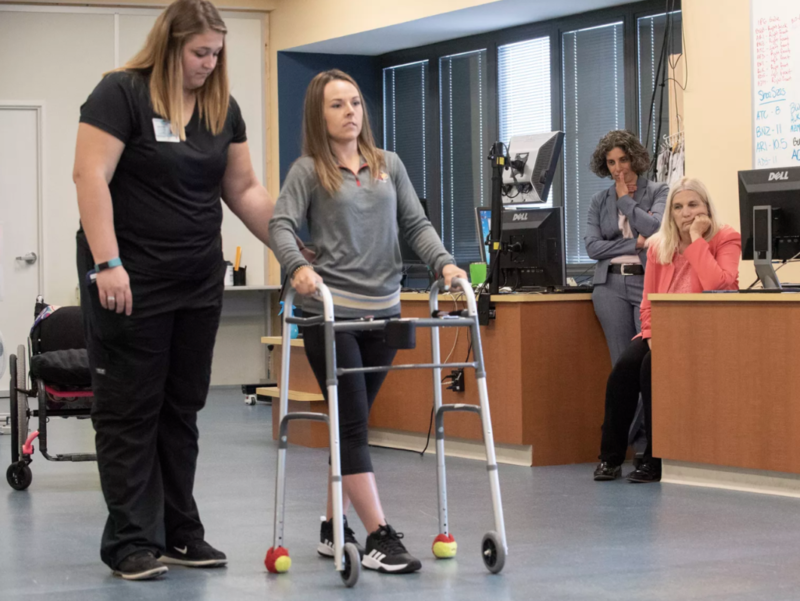 Two patients with complete spinal cord injuries have walked again after participating in a study at the University of Louisville, in Kentucky, USA. Kelly Thomas was 19 when the truck she was driving veered off the shoulder of the road. She overcorrected, the truck went into a roll, and she hit her head on the roof, compressing her spine. Jeff Marquis was paralysed after a mountain biking accident. They both took steps after having an epidural stimulator implanted in the spine. “It’s what everybody had been waiting for — a paralysed person was walking,” Dr Claudia Angeli, Assistant Professor in the Kentucky Spinal Cord Injury Research Center (KSCIRC) told UL News. After months of training on a treadmill and walking across the ground with trainers moving her feet, Thomas took her first consecutive steps on her own in February 2018. “I looked at the trainer, and I started crying,” Thomas told The Verge. Thomas is now back home, living with her parents in Central Florida, and she’s majoring in criminal justice at the College of Central Florida. She can walk with a walker, as long as the stimulator is on. She told The Verge her next goal is to improve her balance so she won’t need the walker any longer. Marquis still uses the poles for balance when he walks several times a week at the research centre, and stands on his own at home using a specially designed frame. But he no longer requires daily, or even weekly, help at home. The research team, led by Susan Harkema, has studied the effects of epidural stimulation in spinal cord injury for more than a decade at UofL. Dr Angeli says they want to see epidural stimulation improve the lives of more people with spinal cord injury. Their study was published in the New England Journal of Medicine in September last year. Two other study participants at the University of Louisville did not re-learn how to walk, however they can stand, hold their torsos upright, and move their legs. “We tested intense locomotor treadmill training with weight support and simultaneous spinal cord epidural stimulation in four patients 2.5 to 3.3 years after traumatic spinal injury and after failure to improve with locomotor training alone,” the study says. “Two patients, one with damage to the mid-cervical region and one with damage to the high-thoracic region, achieved over-ground walking (not on a treadmill) after 278 sessions of epidural stimulation and gait training over a period of 85 weeks and 81 sessions over a period of 15 weeks, respectively, and all four achieved independent standing and trunk stability. “One patient had a hip fracture during training,” the report says. Click here to watch two videos from the study. ‘Team 22’ helps spinal cord injury survivors enjoy a better life“This is further validation of SpinalCure’s commitment to introducing spinal cord stimulation research to Australia as soon as possible,” said SpinalCure Australia’s CEO Duncan Wallace. “Spinal cord injury is no longer a death sentence”.